Part Used & Method for Pharmaceutical Preparations: The rhizomes are dug at the Beginning of Summer (seventh solar term). After the fibrous roots have been removed, the rhizomes are boiled for three minutes, dried in the sunshine and pounded into pieces. Indications & Combinations: Pains due to qi and blood stagnation. 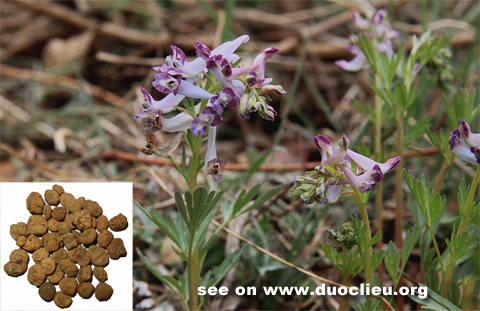 Corydalis tuber (Yanhusuo) is used with Sichuan chinaberry (Chuanlianzi), Chinese angelica root (Danggui), Chuanxiong rhizome (Chuanxiong), Frankincense (Ruxiang) and Myrrh (Moyao). Note: Frying with vinegar enhances this herb's ability to stop pain.